Vettel seems to like to put himself on the grass. Does anybody know why Verstappen was penalised at Monza but Vettel not even investigated in Austria for his move on Hamilton? I could be wrong, but the rule to me is you have to leave a cars width for a car on corner entry. The track is defined by the white lines. In both circumstances, the Mercedes has some kerb next to it. Hamilton went onto it to avoid Vettel. The normal racing line is not using kerb there. Bottas didn't use the bit of kerb so they collided. If Hamilton hadn't have moved out the way, would Vettel have got a penalty? Isn't it still a penalty for Vettel? Or maybe Verstappen was treated harshly here? Yes, you are wrong about the rule. A driver only has to leave a car's width of room on the approach to a corner, if he had gone off the racing line in defence of his position, and on moving back towards the racing line. The difference between the two cases is that Vettel was attacking, while Verstappen was defending. So only Max was bound by the obligation to leave a car's width of space to his left. Which, as you could see, he failed to do. 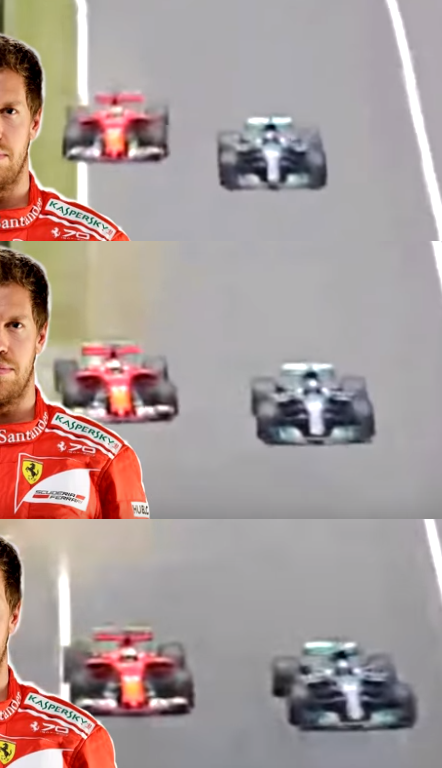 Vettel didn't have to, and didn't. I don't like the fact that F1 allows drivers to run competitors off the track in some cases, but perhaps I forget too readily it isn't a sport anymore. You really think that Vettel would have been alright to bang wheels with Hamilton and run him off the track? I don't understand why you ask me. Vettel didn't bang wheels there, because Hamilton avoided him - possibly in order to try for a switchback. But the point is that the rule requiring a driver to leave a car's width of space isn't applicable in that case. Of course it is, on the entry to a corner Vettel can not simple force Hamilton off the track, it doesn't matter if you are defending or passing. The rule you quote is exactly what makes Vettels Austria move not legal. The bolded part is exactly why, the kerbs are not part of the track. The track ends at the white lines. "Any driver moving back towards the racing line, having earlier defended his position off-line, should leave at least one car width between his own car and the edge of the track on the approach to the corner. However, manoeuvres liable to hinder other drivers, such as deliberate crowding of a car beyond the edge of the track or any other abnormal change of direction, are strictly prohibited. Any driver who appears guilty of any of the above offences will be reported to the Stewards." That would also make this legal - https://www.youtube.com/watch?v=6AzpYilkKrA under your interpretation of the current rules. Which to my interpretation is illegal. Last edited by Johnson on Tue Sep 04, 2018 5:41 pm, edited 1 time in total. No it isn't, what you are saying is another rule. I'm all for drivers on the outside standing their ground and forcing the inside attacker to take a tighter line, and making him brake earlier/harder. But Hamilton didn't. You'll have to explain to me why you think, or why you would be able to think of an interpretation of any of the rules, that would make what Schumacher did there legal. I just can't make what you are saying plus Johnson has just used your rule book to prove what Vettel did was not legal and now I see you are referencing Schumacher to perhaps create a precedence to over rule your rule book? Hamilton still left Vettel room, he didn't force him off the track, he just delayed his turn in like Vettel did to him as shown on the caption. What has Singapore got to do with it, there you have a dynamic of 3 cars whereas we are just dealing with 2 cars, also what Vettel did there was the Schumacher chop, totally different circumstances involving a straight and not a corner. In Singapore Vettel left room as non of the drivers were by his side. I think you need to go to specsavers, for instance if no drivers were by Vettel's side then how did his car get damaged? I feel the whole leaving space thing is a bit of a misnomer in this discussion. Fundamentally if you have a car alongside you, you shouldn't turn into them regardless of how close to the edge of track they are. You can't just ignore a car alongside you and drive where you want. It isn't so simple as that. Essentially, that is what Hamilton did in Italy. Turned in, ignoring the fact that Vettel was beside him. But Vettel has to make allowance for that also - which is why it could be conceded a racing incident. If not, Hamilton would be to blame for turning in as Vettel did nothing but hold to his line. Vettel didn't hold his line, he understeered into Hamilton. To even suggest that Hamilton turned into that corner whilst ignoring Vettel is comical, he left Vettel half the track for a reason. I'll be somewhat charitable and suggest that Vettel was affected by being behind Kimi insomuch that he might not have had optimal downforce that led to the understeer, but to try and pin any blame on Hamilton for that collision is farcical. Not only was he marginally ahead, he left more than enough room. I'm talking about when driving down a straight. Obviously when taking a corner it gets a bit more complicated. Essentially you can't just decide to put your car where somebody already has theirs. Maybe you need specsavers, this has been done to death but what point did Vettel hit anyone? If you have Sky it's the advert, you can see the sequence in slow mo and ultra HD. I think the question being asked is why you believe that the aforementioned manoeuvre by Vettel does not constitute deliberate crowding of a car beyond the edge of the track, which is clearly stated in the rules to be prohibited. No one is suggesting that that block by Schumacher was acceptable. Hamilton had to turn because that's were the track goes otherwise he would have ended up off the track, it was a racing incident as far as I'm concerned but if we are looking to apportion blame it seems that just about everyone in the paddock puts the blame on Vettel. You said that no one was alongside Vettel so how did he manage to damage his car? So the purpose of this thread is another thinly disguised oportunity to bash Vettel? No, I think the purpose of the thread was fairly benign, that being to question where the consistency is on calls like this and why Verstappen got a penalty for doing something quite similar (minus the contact) to what Vettel did in Austria. It may have been turned into a Vettel bash thread, however. It was a fair question of why the stewards believe that whether or not contact occurred should determine whether punishment should be applied. It is one of a number of inconsistencies we see with the stewarding decisions as two very similar incidents can result in different punishments depending on what the outcome of the contact was, whether it involved championship contenders and the past history of the driver at fault. None of which I believe should be a deciding factor. In football a dangerous tackle results in a red card regardless of whether contact is made with the opposing player. What gets me about what Vettel did there is that Hamilton did a similar thing to Vettel at the start of the race in Spa into the first hairpin and Vettel passed comment about it, maybe Hamilton didn't see me? I think Hamilton did that precisely for the reason above, you want to be over aggressive so can I, it's an interesting psyche were a driver can do something to another driver but complains when he's on the receiving end. In respect to what was different with Verstappen is first there was no contact and second Hamilton didn't have to go completely off the track. In Spa Vettel was trying to overtake Hamilton, but at Austria Vettel had the overtake done and was trying to prevent the cut back. Also i suppose you intentionally took the stills after Hamilton had pushed Vettel on the grass before the corner as it does not suit the point you are trying to make. At which point did that happen? Please give the exact second of the push onto the grass and I will gladly make the stills for you Rockie. There was a clear gap between Vettel and Hamilton, Vettel chose of touch the grass not Hamilton forcing him off. And what line was that??? Ah, that may indeed be the angle Johnson came from. I didn't understand how any of the rules quoted could possibly have allowed what Schumacher did. And for the attention of Pokerman: I didn't bring Schumacher into the discussion. I think that many fans believe Max Verstappen was given a penalty for not leaving a car's width of space, but that is not correct. He left Bottas enough room, just as Bottas left Max plenty of room. Max caused an accident, i.e. he ran into Bottas, not the other way round. The stewards' report can be found on the FIA site under Timing and Event information for the 2018 Italian GP. The problem of the difference between Max last Sunday, and Vettel at the Austrian GP - the OP question - is not the car's width of space, but whether Vettel ran Hamilton off the track, or rather whether Hamilton went up the kerbs on his own. Like Bottas did in Monza, Hamilton could have stopped making room for Vettel, instead of going up on the kerbs to his left. Had he done so, Vettel might have hit him, and Vettel would have been given a penalty for causing an accident. To my mind, the rule Johnson quoted in relation to Schumacher's manoeuvre at the Hungaroring was the correct one; crowding Barrichello off the track as forbidden. I can't say what the stewards' exact verdict was, as the FIA archives don't go that far back. As I said in another thread, I’d have pitted and retired him when he said he knew his stupidity was costing him time to Vettel but he didn’t care. The gonads on this kid are a bit too big for his underoos. Max is running that team now. They weren't willing to call him out on DNFing both cars in Baku, and now they won't control him when he throws away points by being willfully stupid. This behavior will cost them in a championship fight, if they reach one with Max and he hasn't fixed his attitude. RB are making a big mistake by going with Max and not Ricciardo, imo. It will cost them. I don't think it will cost them anything I can't see them winning any titles before 2021 anyway. Schumacher vs Montoya , Monza 2003, same chicane. Schumacher even though touched the querb, didn't lose the control, had enough space not to colide and even more as a true champ didn't loose the place. This is hard real racing. But unfortunately Vettel it's no such class as Schumacher. At this time i can only compare Hamilton with Schumacher(active in top teams). There are equal in race-craft, qualyfing speed, knowledge of car, wet race skill. Schumacher was better just in consistence, stuborness, and a more hard-core and aggressive to the limits of rules in race duels. I disagree. Schumi was better in virtually all of factions you mention in my opinion. Neither Vettel not Hamilton is close to Schumi at this point. If any current driver is near Schumi as a driver, it is, in my opinion Alonso... And he is not there either just closer. I think on Speed and wheel to wheel racing Hamilton is up there with him otherwise he's a step below. In fairness we haven't seen Hamilton in a sub par car for ages so it's hard to make a definite judgement but I don't see Hamilton making a championship challenge in a 1997 Ferrari for example. But I do consider Schumacher the greatest ever so it's a tough mark to judge anyone against. I agree. I don't think any driver in F1 history has stood so far ahead of their peers as Schumacher did in the roughly 10 year period between Senna's death and Alonso's emergence. Hamilton, while extremely talented, is not at that level. The brilliance of Schumacher is unmatched, Schumacher remains the benchmark in F1 when you speak to folks who don't follow F1 they know all about him. For me he's the real GOAT! I don't see Hamilton making a championship challenge in a 1997 Ferrari for example. I doubt he would pass scruteneering! Yes between Senna's death and Alonso's emergence, could a prime Schumacher dominate today's grid bearing in mind that Alonso very much matched him in 2006? yes, I believe a "prime" Schumi would be the DOMINATE driver in the field today. He might be viewed as the best like some view Alonso as the best but I don't think he would dominate unless he had the best car, for instance Ferrari had a decent car in 1998 but he didn't beat Hakkinen. Like I said Schumacher was about the same age as Alonso is now when many believe that Alonso matched him, Alonso doesn't look diminished. The year after Alonso matched Schumacher he himself got matched by Hamilton in the same car. I think today's grid is too strong for one dominant driver who can basically dictate who he drives for, a grid of Alonso, Hamilton, Verstappen and Vettel, but he did dominate F1 for 10 years which no other driver has done, more wins, more titles ranks him as the best. I agree with some of what you are saying, poker. I did say that I think Schumi would be the DOMINATE Driver...whether he dominated the points would require, at the very least, a competitive car...and some luck. I don't think so. In about equal cars it would be close between LH and MS (and FA) IMO. I agree. As POBRatings used to say when he was around this forum, there's never been much difference between the absolute top drivers within the same era. In terms of his speed as a racing driver, I believe Schumi would be matched by Alonso and Hamilton. In terms of his greatness - which is a very different thing - he's head and shoulders above them. Schumacher changed the sport forever, and all modern drivers follow his pattern of preparedness and technical attention. His legacy will stand above the two of them (certainly Alonso, sadly) but I believe they would be very close in terms of ability.